Geotag photos using a tracklog and import them to iPhoto. Is there a better alternative to Geotagalog? Is Geotagalog really the best app in Author Tools category? Will Geotagalog work good on macOS 10.13.4? Geotagalog... Why import ungeotagged pictures into iPhoto, when it's so straightforward to GPS-enable your favorite camera? Geotagalog is a straightforward tracklog-based geotagging utility for iPhoto. By using GPX, NMEA, IGC or TCX files from a handheld GPS receiver to geotag your photos, you can work less to get more out of the Places feature in iPhoto '09. As Geotagalog imports from a camera or disk, it uses sophisticated geotagging algorithms to match pictures to the GPS history in your tracklog. 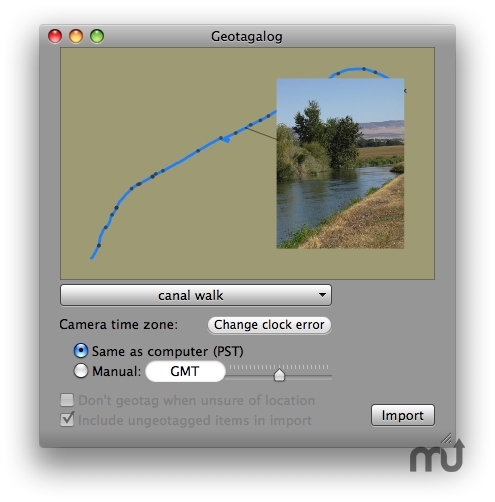 Location-enable your favorite digital camera with Geotagalog's simple workflow! Now properly handles photos that are already imported into iPhoto. Can assign iPhoto Places without modifying original files. Can optionally geotag photos without any iPhoto import. New "geotag helper" does the slow work in the background. This is the first public beta, so please email support@calftrail.com with any bugs or confusing issues you encounter!